Take a closer look into waterfowl hunting in the Midwest. You will be surprised at what you find. A hunter wades out of a Nebraska pothole after a successful Sandhills adventure. Let's play a game. I'll say a word, and you, Mister Hunter, tell me the first thing that comes to mind. Ready? Ninety-nine times out of 100, the first thing to come to the hunter's mind will be whitetails. Sure, some will say turkeys, and others, those living in Iowa perhaps, will say ringneck pheasants. Few, though, will say ducks. Which brings to mind two additional words. Why not? Granted, states like Ohio and Michigan have built their hunting reputations on nationally recognized whitetail deer populations and the trophy bucks that come as part of that package. And, yes, Indiana and Iowa both are known for their long-bearded gobblers, but yet those who look at these states and don't see the fabulous waterfowling awaiting within are certainly overlooking some of the finest duck and goose hunting that the eastern United States has to offer. So, and while we certainly won't forget 10-pointers and foot-long beards, let's take a look at just what the Midwest brings to the table once the winds of fall begin to blow, and that annual event known as duck season starts anew. One look at the Missouri River at Santee is all it takes to know that this body of water means business; serious duck business. Located in the northeastern corner of the state, the tiny town of Santee sits on the edge of the Santee Indian Reservation and on the shores of the mighty Missouri. Here, a concrete boat ramp provides access to what can only be described as a mallard hunter's dream come true--miles upon miles of shallow-water potholes, large and small, many surrounded entirely by cattails and some reached only by way of a serpentine route known best to flying greenheads and the local population of muskrats. Each fall, this huge collection of puddles and ponds attracts tens of thousands of ducks and geese, the vast majority of which use the Missouri River as an eons-old navigational aid on their annual trek from Points North to wintering grounds in Arkansas and Louisiana. 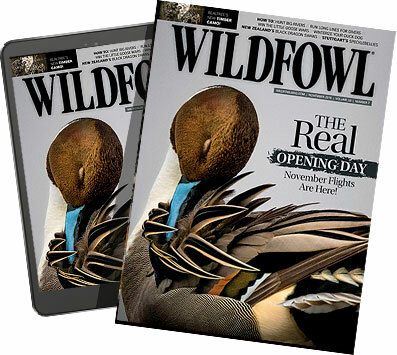 Attracted, too, are hundreds of waterfowlers from all across the country, all of whom come to take advantage of this immense public hunting area and the rich avian bounty it provides. Fortunately for those hunters adverse to the thought of gunning amongst a crowd, the Missouri at Santee provides more than enough room for any number of fowlers--and in most cases, ample birds to go around. With a handful of exceptions, the Missouri at Santee is a big-boat show, with well-camouflaged 16- to 18-foot plate boats or sleds (jon-style watercraft) powered by 90 or more horses the norm. Runs from the ramp using the main channel of the big river as a thoroughfare can be a mile or more, something that sanity dictates not be attempted in a 12-foot V-bottom with a six-horse outboard, two men, and four dozen decoys. Near-shore waters, however, can often be hunted from smaller craft such as canoes or oar-powered duckers like the AquaPod (360-887-33580; www.attbar.com). Eastside or Westside. In Iowa, the choice really doesn't matter as Hawkeye State waterfowlers reside smack dab in the middle of two of the nation's foremost migratory flyways, the Missouri and the Mississippi river's. Is it a "Slow day on the Ole' Man?" Depending on where the Eastside hunt takes place, it's a short 275 miles to the other edge of the state and, as is often the case, an entirely different and at times dramatically improved set of circumstances. For those choosing the Missouri system, the options begin near Sioux City to the north and end near the town of Hamburg in Fremont County to the south. In between, waterfowlers can choose from any number of state or federally owned wildlife management areas or refuges, including the Riverton and Forney Lake complexes in Fremont County, the Solder Bend, Round Lake, and Deer Island areas in Harrison County, the Blue Lake Wildlife Management Area near Onawa, and the Browns Lake or Mile-Long Island areas in Woodbury County just south of Sioux City. Some of these wetland areas, like Browns Lake for instance, are comprised of old oxbows of the Missouri itself; others, like Riverton and Forney Lake, are managed by the Iowa Department of Natural Resources specifically for the purpose of waterfowl hunting. Not enough? Well, a very rough estimate acknowledges more than 135 miles of river between Sioux City and the Missouri-Iowa state line--more than enough for even the most antisocial duck hunter. Switching to the eastern edge of the state, Iowa waterfowlers have at their disposal an estimated 300 miles of opportunity known simply as the Mississippi River. Here, hunters will find everything from early-season blue-wing teal and wood ducks to late-season flocks of canvasbacks numbering into the tens of thousands. Not surprising when dealing with an area the size of the Mississippi, the list of public hunting possibilities along the river is rather lengthy. Beginning with the Pool Slough and New Albin Lake wildlife management areas in the far northeastern corner of Allamakee County, hunters can find excellent access and gunning at points such as the towns of Lansing, Guttenberg, Bellevue, Sabula, Clinton, and Burlington. Along the way, state-held properties such as Green Island south of Bellevue and the famed Lake Odessa Wildlife Management Area near Wapello provide additional choices, not to mention phenomenal gunning throughout much of the regular season. This watefowler looks forward to a low-impact hunt in an eastern Iowa slough. Like Iowa, Illinois features a wealth of waterfowling potential. And again like its neighbor to the east, the state is bordered or coasted by a trio of excellent and very well known hotbeds of duck and goose hunting activity and tradition. These include the Mississippi River on the west, the Ohio and Wabash rivers in the southeast, and the waters of Lake Michigan in the northeast corner. The waters of the Mississippi River--the Big Muddy--have long been recognized for their attraction to both hunters and anglers. Waterfowlers traveling to the shores of the Ole' Man will at first be amazed with what appears to be an almost infinite amount of hunting opportunity, and rightly so. Illinois alone includes over 60,000 acres of land and water known as the Upper Mississippi River National Wildlife Refuge, much of which exists in the form of main stem, backwater, tributary, and temporary waterfowling situations. It's a big body of water to be sure, but those seeking divers and dabblers alike will find more than ample potential, all courtesy of the Mississippi River. Goose hunters in southern Illinois will want to be sure and schedule a day or two around Crab Orchard National Wildlife Refuge. Located between the towns of Carbondale and Marion, Crab Orchard has long had a reputation as one of the country's premier Canada goose locations. Those looking for the ultimate goose hunting experience may wish to set aside one day to spend in the blind with World Champion caller Tim Grounds of nearby Johnston City. With his 12-year-old son, Hunter, a five-time Junior World Goose Calling Champion himself, Grounds operates Tim Grounds Legendary Hunts out of his appropriately named Honkerville Lodge, and offers in addition to some of the finest dark goose hunting in North American, the chance at one of the best outdoor educations going. Those interested in spending time with Grounds can contact him at 618-983-5649, or by writing Tim Grounds, 1414 Barham, Johnston City, IL 62951. East of Grounds' Johnston City location, waterfowlers will find additional chances to ply their trade along the Wabash and Ohio rivers. December's the time to hit these moving waters for big, fully feathered drake mallards and a variety of divers; however, the Canada goose hunting up and down the rivers can often be nothing short of phenomenal. Fans of the big water can try their luck on Illinois' portion of Lake Michigan; however, most of the state's waterfowling contingent will try their luck farther inland on public areas such as Snake Den Hollow State Fish and Wildlife Area (Knox County), or the Rice and Spring Lake areas located along the Illinois River, itself a wonderful waterfowling opportunity, south of Peoria. The interior and exterior, is the best way to describe waterfowling in The Hoosier State. Here, exterior means the Ohio and Wabash rivers which create a southern and partial western boundary, while interior can best be defined to read a series of streams, rivers, and accompanying wetlands such as marshes, swamps, and backwaters located well inside this pair of very familiar waterways. Anyway one looks at it, though, interior and exterior add up to only one thing in Indiana--waterfowl. Late-season gunning means moving water, and few are the places as productive as either the Ohio or Wabash rivers. Dabblers like mallards, blacks, and green-wing teal, as well as divers such as scaup, goldeneye, and buffleheads, will remain in their northern haunts as long as food is available and the water is open. Fortunately for these birds and the folks who hunt them, both the Ohio and Wabash more than meet these criteria. This hunter is hiding in a corn stubble field in Iowa with his gun dog, Maggie. Moving inland, hunters are greeted with several flowing-water choices, including southern Indiana's Patoka and White rivers, the Kankakee in northwest Indiana, and the St. Marys and Maumee rivers in the eastern half of the state. All can be red-hot at times, and many, like the Patoka, course through or create state-owned public hunting areas that in and of itself can provide excellent shooting. Diving ducks are to Lakes Michigan and Huron like, well, Santa Claus is to Christmas. Without either ducks or Jolly Old Saint Nick, the lakes and the month of December just wouldn't be the same. And no place is more traditional in terms of historic waterfowling than Lake Huron's Saginaw Bay. Located on the eastern edge of the state, the bay has for decades provided some of the finest shooting for bluebills, redheads, canvasbacks, and other divers in the country; some would say, the world. Here in the choppy waters of Lake Huron, the layout boat became an art form, and the men who built and used them, artists. Today, layout hunting on Saginaw Bay is still very popular; however, many waterfowlers are now opting to keep their feet on relatively dry land, and take advantage of the many fine state-owned wildlife areas that line the bay's shore. Traveling east from the bay's southern tip near the town of Bay City, duck hunters can choose from several public areas, including the Quanicassee, Fish Point, and Wildfowl Bay state wildlife areas. North of Bay City, options in the form of the Tobico Marsh, Nayanquing Point, and Wigwam Bay wildlife areas provide additional potential. But it doesn't end there. Lake Michigan forms the western border of the state, and creates an almost endless array of deep-water and shallow marsh possibilities, as does Lake Superior on the northern fringes of the Upper Peninsula. Inland, a vast network of rivers and streams, coupled with dozens of state-owned wetlands like the Houghton Lake State Wildlife Research Area near Houghton Lake and the Rose Lake Research Area located northeast of Lansing allow for uncrowded waterfowling well into the latter part of the year. potholes, beaver swamps, shoreline breakwalls, and the ultimate in historic waterfowling, offshore layout hunting. In the western part of the lake, duck hunters can take their pick from several state-owned permit and walk-in areas. These include the famed Magee Marsh Wildlife Area, and Metzger Marsh; both within stones throw of the Lake Erie shoreline. Farther inland, the Toussaint and Little Portage River wildlife areas provide additional opportunities. Here, too, duck hunters will find the legendary waters of Maumee Bay, home to some of the finest layout shooting in the country. Bluebills, ringnecks, goldeneyes, buffleheads, redheads, and the king of divers, the canvasback, make Maumee Bay their home, and offer those willing to sacrifice the warmth and comfort of a land-based blind a waterfowl experience the likes of which lifelong memories are made. But if Lake Erie is Ohio's North Coast, then the mighty Ohio River can lay claim as the state's South Coast. Here, duck and goose hunters alike will find a wealth of possibilities, both on the river itself, as well as on any of many feeder streams and rivers. Quiet backwaters, too, lend themselves to freelance-style waterfowlers with their small jonboats and often elaborate boat blinds. Goose hunters will want to take advantage of the thousands of acres of agricultural land that borders the main stem of the river, and it often doesn't take much more than a dozen full-body Canada decoys and a bit of convincing calling to fill a limit--that is, once the birds have been located. But if the expanse that is Lake Erie or the Ohio River seems intimidating or far away, there's plenty of good hunting to be found within the interior of The Buckeye State. In northeastern Ohio's Trumbull County, the Grand River, Mosquito Creek, and Shenango wildlife areas all provide good duck and goose hunting. Traveling west to Williams County, the Lake La Su An wildlife area offers not only uncrowded waterfowling, but also some of the most picturesque scenery and without question the best bluegill fishing that Ohio has to offer. Goose hunters will want to be sure to check out the fantastic hunting around Columbus' trio of impoundments--Alum Creek, Hoover, and Delaware lakes. It's a shared waterfowling resource, this great Mississippi River system. And sharing in the wealth and riches are those gunners residing in the state of Wisconsin. As is the case along the eastern edge of Iowa, Badger State waterfowlers enjoy an almost infinite number of hunting opportunities along the more than 200 river miles of wetlands that they split with residents of the states of Minnesota and Iowa. Beginning across from the town of Red Wing, Minnesota, Wisconsin license holders have their choice of hunting the main stem of the river itself, or any one of the many riverfront or near-riverfront state holdings along its course. These include areas such as the Tiffany Bottoms WMA located at the confluence of the Mississippi and Chippewa rivers, the Whitman Dam WMA near Cochrane, and portions of Pool 9 at Ferryville, famous for its excellent canvasback hunting, as well as sections of Pools 10 and 11. Because much of the Mississippi River, shipping channel and shallows alike, falls within the federal holdings known as the Upper Mississippi National Wildlife Refuge, waterfowlers are advised to research thoroughly those areas they wish to hunt well in advance of the season. Information concerning hunting rules and regulations as they pertain to the river corridor can be obtained either by contacting the Wisconsin Department of Natural Resources, or by visiting the U.S. Fish and Wildlife Service's website at www.fws.gov.